Fashion trade fairs successful again, this year for the first time with bloggers. The 51st STYL and KABO trade fairs showed trends for the next season in the clothing, textile and footwear industries: the increasing power of bloggers and digital influencers, the demand for sustainable fashion, the invasion of new technologies, and letting the customers be a part of the business and development process. The expositions of 241 exhibitors from more than 18 countries introduced collections of almost 800 fashion brands. In the three days of the trade fair, the new collections attracted approximately five thousand professional visitors, traders and buyers. The Brno fashion trade fairs are the only B2B presentation of the fashion industry for the Czech and Slovak market. This year, 46 companies introduced themselves for the first time ever, and 64 Czech manufacturers were also among the exhibitors. Most of the foreign brands came from Germany, Slovakia, and Poland. There is a continuing interest in the trade fair from fashion designers from the Czech Republic and abroad, who in great numbers presented their work both at the exhibition stands and fashion shows (E. daniely and Lada Vyvialová from the Czech Republic, Valentina Bebeh from Russia, Saray del Saz from Spain, Zuzana Bottková from Slovakia, Anja Pfefferkorn from Germany). A new added value of the fashion trade fairs was the “Help center STYL” concentrating all the important information for manufacturers and traders in one place, such as the regulations and norms for import, the marking of goods, or returning goods and consumer protection. The new feature was very popular; most of the questions were centered around clothing sizes, maintenance symbols, and material composition marking. The Help center will be open in August as well, this time not only at STYL, but also at the KABO trade fair. As is tradition, the only lecture in the Czech Republic given by a foreign expert on fashion trends was an essential part of the trade fair. 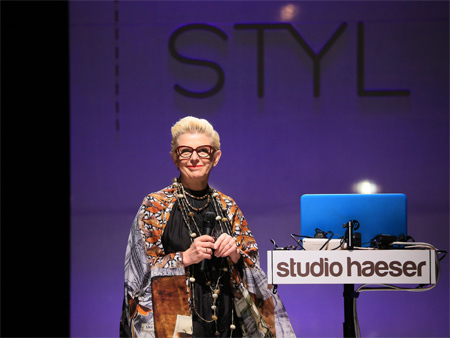 On Sunday, traders, exhibitors, and other curious visitors attended a captivating lecture given by the Dutch expert Ellen Haeser on trends in women’s and men’s fashion for Fall and Winter 2018/2019. The key message to take away was the new business model for sustainable fashion. The model reacts to the ongoing change of consumer demand which is shifting from fast fashion to lasting values and a unique personal style. The lecture finished with a fashion show with commentary, featuring some of the trendy models Ellen Haeser selected from the exhibitors’ collections. The supporting programme dealt with various topics interesting to manufacturers, traders and consumers. Some of the issues discussed were the GDPR (a new regulation by which the EU intends to strengthen data protection for individuals), choosing the right underwear, the advantages of Merino wool, the inspiring history of Baťa, and the long-term sustainability of a unified price for different sizes of bras. 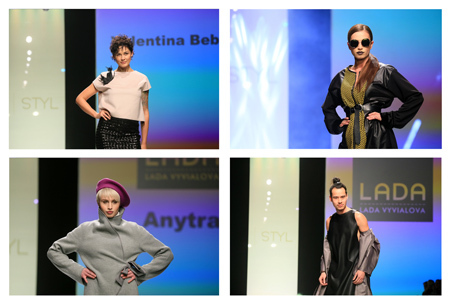 On the occasion of the fashion trade fair, prestigious awards were given by the magazine Svět textilu & obuvi to two outstanding individuals from the industry. Ing. Lenka Urbánková Jarešová, Chairwoman of the Board and CEO at TONAK, became the Person of the year 2017 in the textile and clothing industry. The Person of the year in the footwear and leatherwear industry award went to PhDr. Vlasta Mayerová, the longtime secretary of the Czech Footwear and Leather Association. For the first time ever, famous Czech fashion bloggers attended the trade fair. The bloggers selected models for the special exhibition BLOGGERS & DESIGNERS SHOW. Michaela Salačová and Nikol Moravcová each picked out six inspiring outfits. The fashion show also witnessed foreign designers Saray del Saz and Debbie Brown with their collections of alternative fashion, evening dresses and luxurious wedding dresses. I’m thrilled to have been here at the STYL trade fair in Brno. I introduced my new collection at the gala evening exhibition, and partly also throughout the day, and I have to say that the fitting was very professional. Last year, E.daniely came back to Brno after a long time of absence, and from a business standpoint, STYL is a success again. We’ve been going to STYL for three years, though until now only in August. Saturday was the most active day for us – we couldn’t stop even for a second. Pre-orders have been made, we have widened our network of contacts, and we will see if anything comes out of it in the future. From our perspective, the trade fair went as expected. In the four years – or eight seasons – we’ve been coming here, we’ve built ourselves a group of clients who keep coming back to us. I like this trade fair for its family-like atmosphere, too. We are a Czech company focused on the production of socks, from classic, formal ones to the more sporty kind or even football socks. We have been coming to STYL for ten years because it still has value to us. We are one of the regular exhibitors. One of the positives of this year was the fact that there were new brands present at the trade fair which were sought after by the retailers and brought in new customers who weren’t previously familiar with us. We are a family business dealing with traditional Jablonec bijoux. Those who come to us will find bijoux jewellery of our design, all of it hand-worked, with all the beads coming from Swarovski. We have been attending the trade fair for ten years. Every six months, it’s a place we love to come to and exhibit our goods. Our company is focused on collections of women’s winter jackets with real or faux fur, baize coats, and other products. Because of this, we always attend the trade fair in February with the goal of meeting new clients. This year, our stand was at its busiest during the weekend, when we observed a very respectable number of attendees, even though most of them were our usual customers. People don’t want to only wear clothes made in China, they want pieces from domestic brands to be a part of their wardrobe as well. A certain part of the textile industry has remained here in the Czech Republic, and I’m sure it is going to be true in the future, too. This is why we support the textile and clothing cooperatives in our union, of which there is not a small number. Two of them have separate stands here at STYL, and four more exhibit their products at our combined exposition. In Brno, we exhibit our models twice a year; our main customers are owners of small boutiques. We’ve got many regular clients, but in the last couple of years we’ve been getting new ones as well. We can get to know them only in Brno, because it’s the only place we offer our goods. As suppliers of sunglasses, this is the first time we are at the STYL trade fair. Boutique owners come to us to find the accessories they need so that they can offer their customers full service in choosing their summer outfits. For instance, some of the men’s fashion shops’ representatives came here to get sunglasses of various designs and materials. So far we are satisfied. I like seeing the exhibitions, how they’re organised, and what they look like from the backstage. I think that this trade fair still has its place in the fashion industry. Choosing the models for the exhibition wasn’t difficult at all, as the exhibitors have a lot to show for themselves. If I had to choose more than six outfits, it wouldn’t be a problem. So far I’m really enjoying the STYL trade fair and I’m really curious about the exhibition, because until now I’ve only seen it from the backstage. I think it’s going to be magnificent. Many of the models here are my friends, which is also great. Everybody is extremely nice! And the trade fair is really big as well – I have to say that I’m surprised. The 52nd International Fashion and Footwear Trade Fairs STYL and KABO will take place from the 18th to the 20th of August 2018.